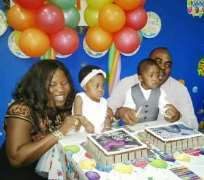 Popular Nollywood actor, Emeka Ossai celebrated the first birthday of his twins, who were given birth to in 2013. The actor was joined by his wife, Jumai and both gave the cute children something to remember for a long time, having taken them a few years to wait before conceiving the twins in September 2012. On Friday, September 20, 2013, the twin baby boy and girl had their birthday staged and their parents were in joyous mood to rejoice with them in good health.